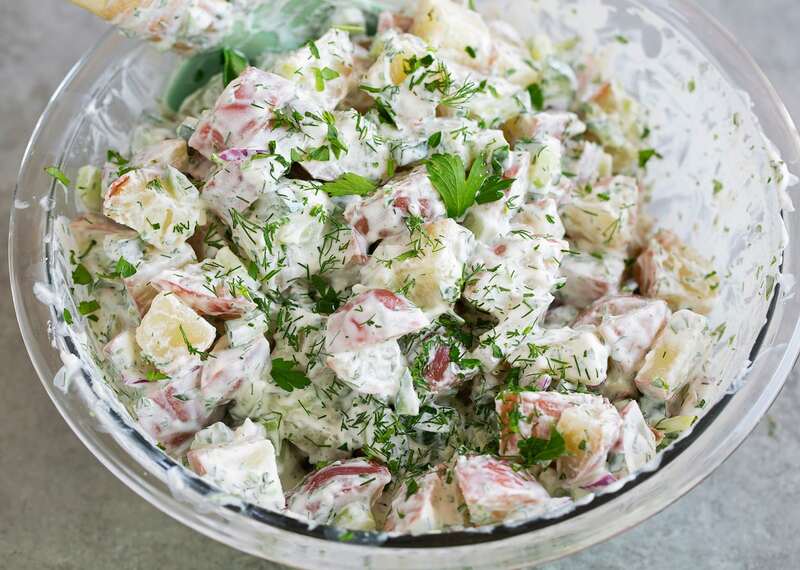 This Greek Potato Salad with a homemade tzatziki dressing is the most refreshing potato salad! It’s deliciously creamy, it has lot’s of fresh herbs, and that bit of lemon gives it the perfect summery touch. 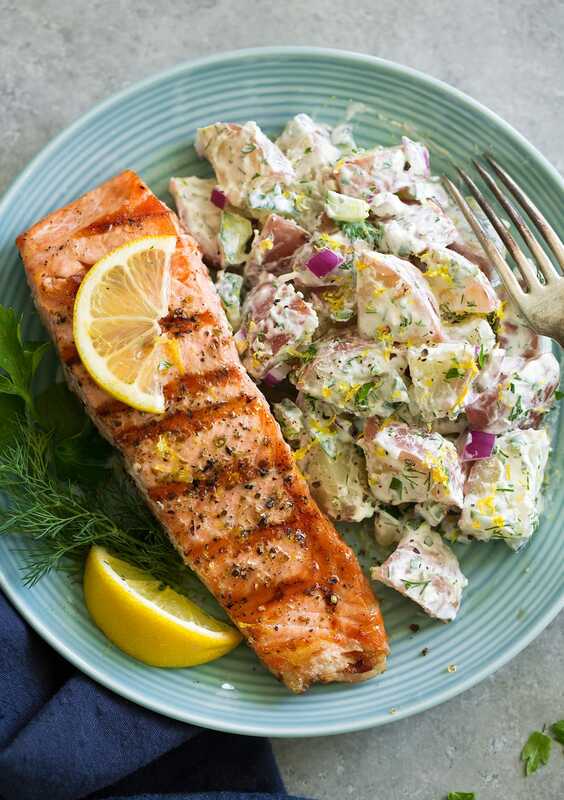 Plus this dressing uses mostly Greek yogurt instead of all mayonnaise, so this is a healthier alternative to the classic potato salad. 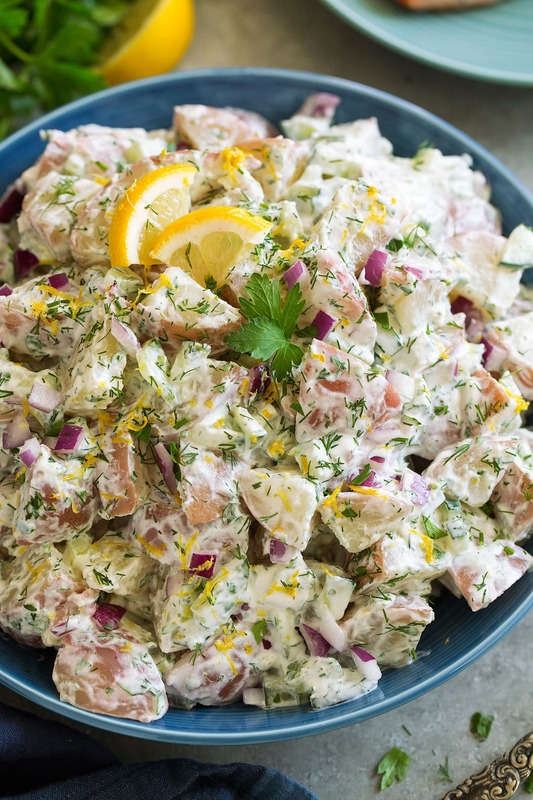 I’ve long loved that beloved dill swirled fresh tzataziki sauce and the other day I was thinking it would be the perfect addition to a potato salad for a Greek spin, and oh how it is! Not only is it delicious but as I mentioned it’s a healthier, lighter alternative vs. using 1 cup+ of mayonnaise. Here I felt like 1/4 cup mayonnaise gave it the perfect amount of richness but if you are looking to make this even lighter you can use light mayonnaise. Or even omit the mayo and use whole Greek yogurt instead. First you’ll boil dice the potatoes then add to a pot and boil in water until fully tender. Drain and let them cool completely in refrigerator, or to chill quickly spread onto a rimmed baking sheet and freeze for about 10 – 15 minutes. While the potatoes are cooling you’ll prep the dressing. 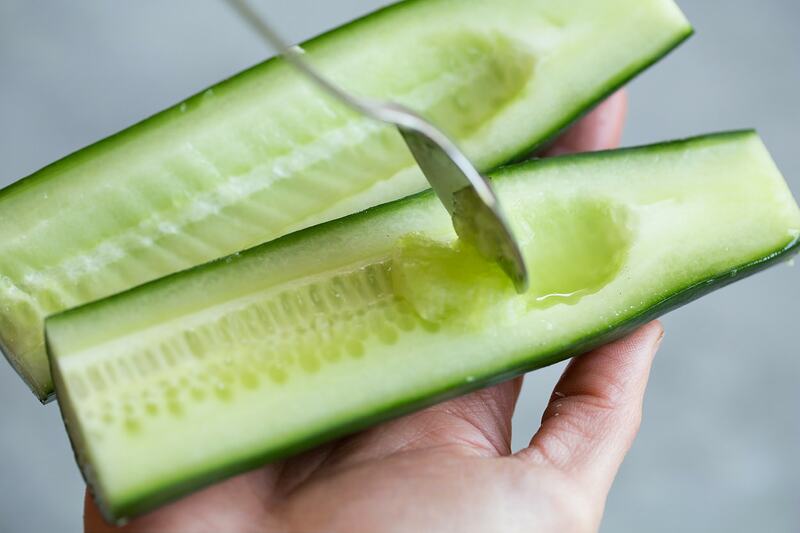 To start you’ll seed and dice the cucumber. 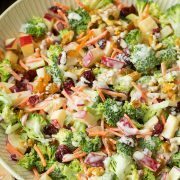 Then toss the ingredients for the dressing together in a larger mixing bowl (if you just mix the dressing in the bowl you’ll be using to toss the salad you won’t need to dirty two bowls). Then add the potatoes and red onion. Give it a good toss to coat everything. Sprinkle with a little more dill and parsley as desired and serve. Grilled salmon (here I just added some olive oil, dried oregano, basil and fresh lemon). 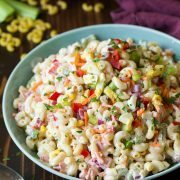 Summer is just around the corner and this is one of those recipes you’ll want in your back pocket for all the summer get togethers. I have the feeling it will become a crowd favorite! Feel free to double up the recipe as needed. 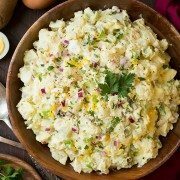 The most refreshing potato salad! It's deliciously creamy, it has lot's of fresh herbs, and that bit of lemon gives it the perfect summery touch. 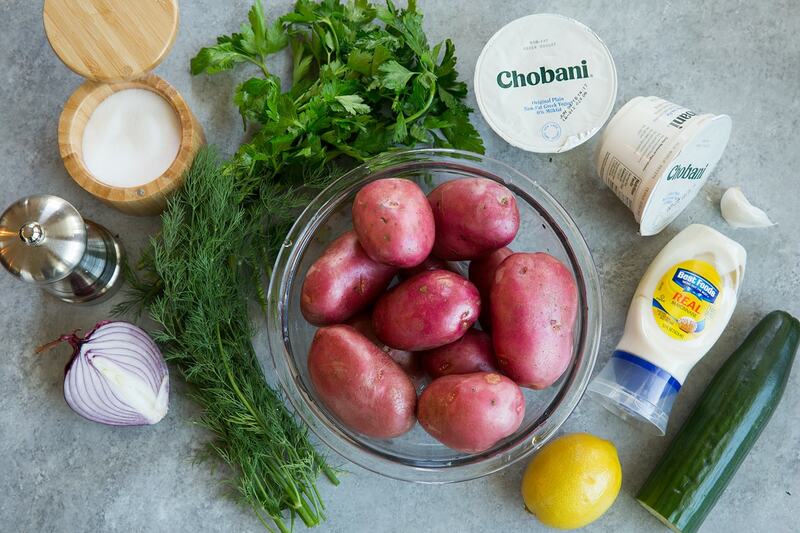 Plus this dressing uses mostly Greek yogurt instead of all mayonnaise, so this is a healthier alternative to the classic potato salad. 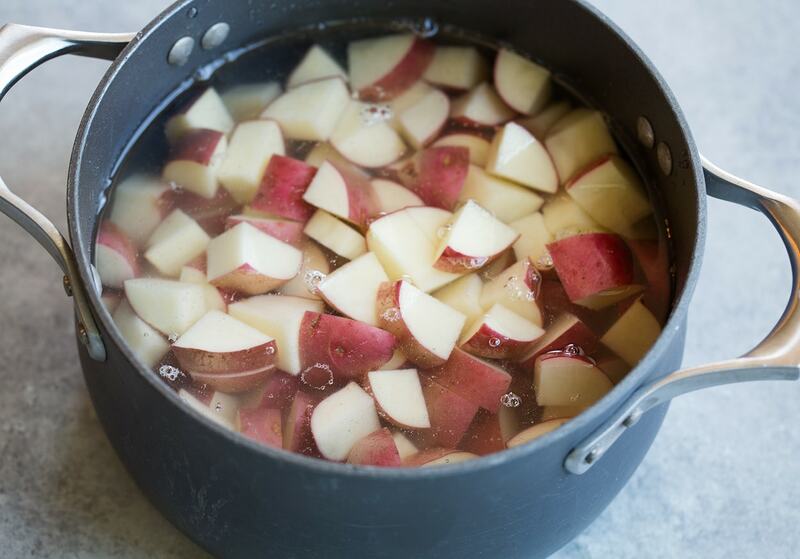 Place potatoes in a large pot then add enough water to cover and season water with a teaspoon of salt. Bring to a boil over medium-high heat then cover and reduce heat to medium-low and let simmer until potatoes are fully tender, about 8 - 10 minutes. 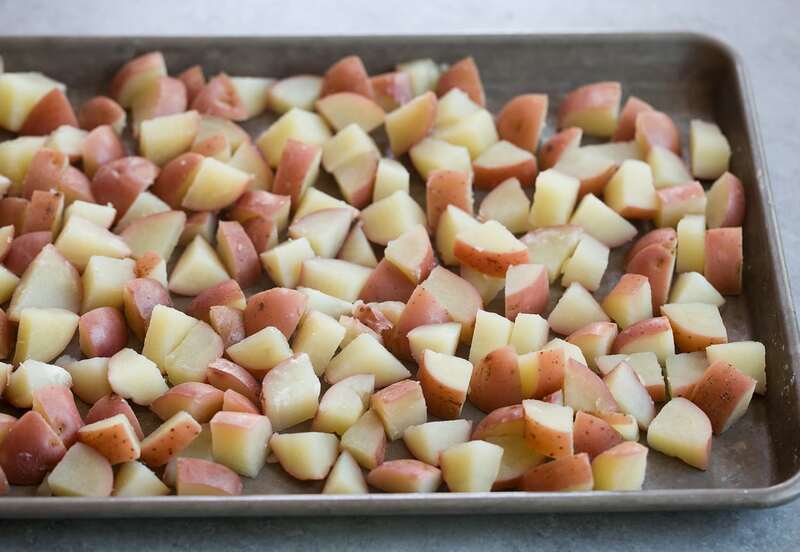 Drain potatoes, then chill fully (to chill faster spread onto a rimmed baking sheet and freeze for about 10 - 15 minutes). Meanwhile place diced cucumber on a few layers of paper towels and wrap and press to remove some of the excess liquid. 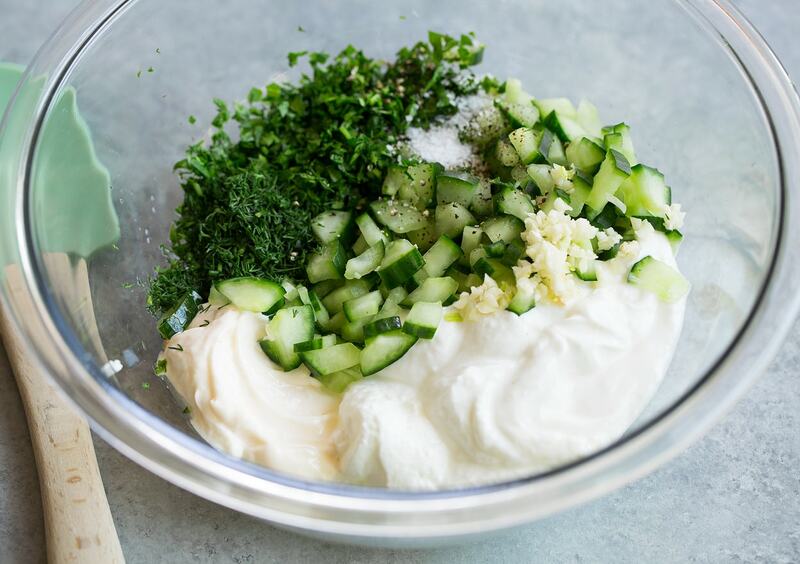 Transfer cucumber to a large mixing bowl, add in Greek yogurt, mayonnaise, parsley, dill, lemon juice, and garlic then season with salt and pepper to taste. Stir mixture. 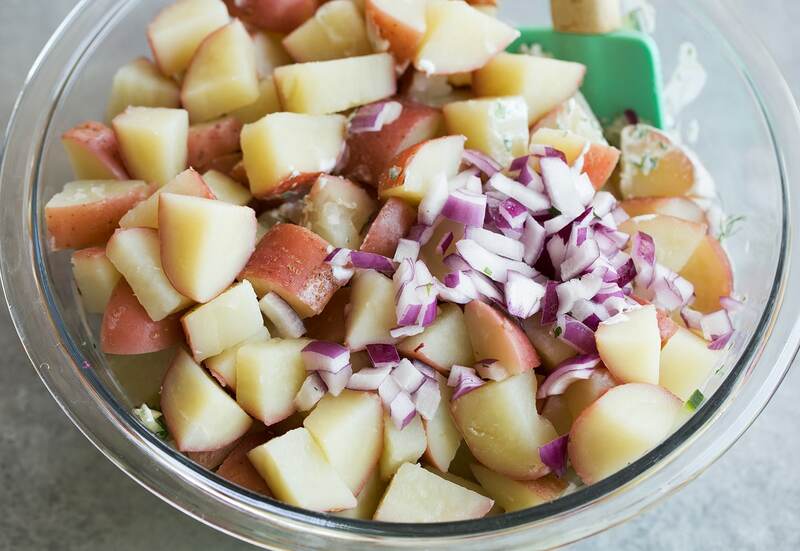 Add potatoes and red onion to bowl then toss to evenly coat. Serve within a few hours garnished with more parsley, dill and lemon zest (keep chilled). *You can set some of the dill, red onions and lemon zest aside to garnish over top if desired. Cindy: Hi Jaclyn, how long can i keep the salad in my fridge? Debbie Farr: Sounds do good and I married into a Greek family so this will impress them I am sure. I do have one question, you don’t list the red onion in the recipe. How much?